My father loves oats and he also loves cookies and biscuits. I wanted to bake oatmeal cookies for him when he came in for a flying visit last week en route to Moscow on a business trip. 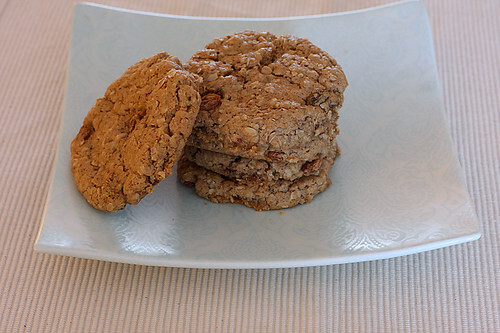 “She makes awesome eggless oatmeal cookies” said a friend referring to another common friend. I remember having asked her how she made her famous oatmeal cookies and her reply: “Just throw in some butter, sugar, flour and oats in a bowl, make a dough, divide them into cookies and bake them in the oven”. Many cook by inspiration and instinct and consider recipes and guidelines quite cumbersome. Some of the best cooks I know are also the worst at giving the exact proportions. But, I belong to the category of cooks who painstakingly documents every part of the recipe. At times while noting the recipe in my book I even write about the feelings and emotions I went through while making the food and my sentiments after eating it. What I enjoy even more than recording my thoughts and opinions are those of others around me. Them enjoying my edible creations makes me really happy. These cookies were enjoyed by my father, friends and relatives who are visiting and is definitely a keeper recipe for me. I decided to use flax seeds as an egg replacement and they do a marvelous job of binding the dough as well as adding a subtle nutty flavour, intrinsic to them. That they are rich in health giving properties is an added bonus. 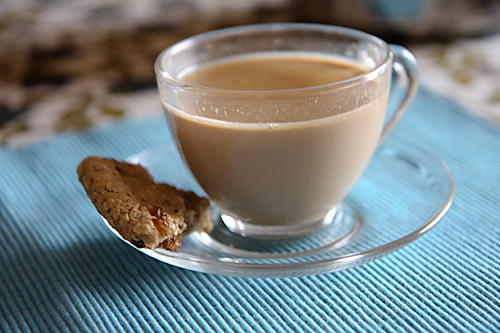 These cookies are also a perfect treat with that cup of rooibos or decaffeinated cup of coffee for me. Use granulated sugar for a more chewy and rustic flavoured cookie and fine or powdered sugar if you prefer a softer feel in the mouth. 100 gm (1/2 cup) light brown sugar. Line a baking tray or cookie sheet with baking parchment or greaseproof paper. In a blender or food processor (using the smallest attachment) powder the flax seeds. Put in the water and blend again until well mixed. In a bowl mix the flour, rolled oats and soda together. In the bowl of a stand mixer or in a big bowl if doing by hand cream the butter and the sugar. Stir in the flaxseed mixture and mix well. Put in the dry ingredients and mix again until well blended. Stir in the raisins and mix until uniformly distributed. Divide the dough into 12 balls. Flatten each ball slightly with the help of your palms and place on the prepared tray. Bake in a preheated oven at 180C /350F/Gas Mark 4 for 18 to 20 minutes or until golden brown at the edges. I didn't know you could make cookies without eggs. Amazing work! 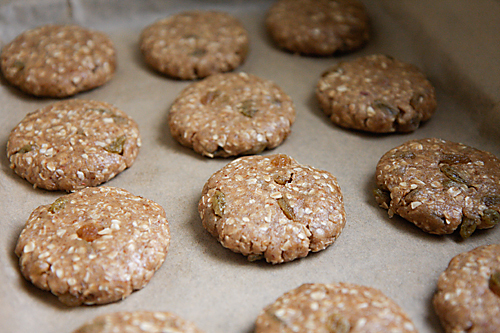 Perfect cookies u've got…oat meal is different from normal quick cooking oats? Sharmilee: Yes I have used quick cooking oats here. Cookies look perfect for tea time! These cookies look delicious!! Will keep these in mind, especially when I'm in the need of eggless cookies! Great looking cookies! I've always thought eggs are needed when making cookies, this is definitely new! Good job. Hi again,I love oatmeal cookies and i want to try your recipe,they look soo good!What can be use to substitute flaxseed?? devi108: I'm glad yoy like these cookies. I havent tried substituting flaxseeds and I suggest its worth the effort of procuring them. They lend a lovely nutty flavour, are nutritious and an excellent egg substitute here. I made these yesterday and they were great. I shared them with two of my friends and they too liked them a lot. Thank you Anushruti, for sharing such a super hit recipe. And being egg-less was definitely a boon to me. Next on my to try list is the very scrumptious looking mango cheese cake. it was a lovely recipe and the cookies came out really well and huge.They were crunchy on the outside and chewy in the center.The only problem was that my raisins got burnt and shall i bake it for more time for a through and through crunchy texture. Vidula: Yes! You could bake it longer for a more crispier texture. Wondering if you have tried this with applesauce with less sugar and butter? sun: I havent tried this with applesauce. The ingredients here are quite healthy as opposed to regular cookies and these cookies are not overloaded with sugar. Great to indulge once in a way! Hi, is there any substitute for raisins? I'm not really a fan..
swati: You can use cranberries or dry fruits like chopped fig and apricots. swati: This will taste good even when plain. 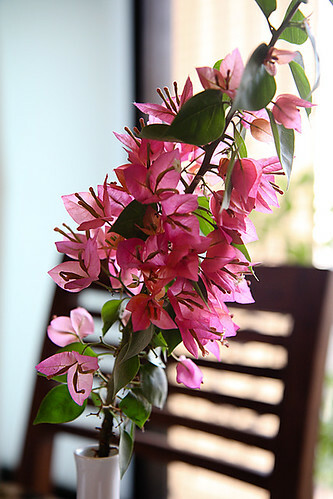 Sreeja: I have seen it in some super market stores. I pick up stock from a dealer in Cochin. Please refer my rooibos post for the contact details. Hi ! finally have found a doable recipe. thanks so much ! A question: when u say granulated sugar, is it the regular white refined sugar we use at home? also, can i use a cup of brown sugar instead of a half a cup of each? Saumya: Yes it is the regular white sugar. You can use brown sugar too but sometimes the excess molasses can leave a slight bitter taste. If you have good quality brown sugar then you can try it. Hi, could u pl tell me, is there a difference between white wheat flour n whole wheat flour. Also, when u say, soda bi carbonate, could I use the regular 'Eno' sachets ? just made my first batch of these cookies…. baking after ages…. made me feel soooooo good….. perfecto….. superbo…. Taruna: White wheat flour is processed a little and whole wheat flour is unprocessed flour. White wheat flour is similar to maida while whole wheat flour is atta. Eno and Soda bicarbonate are completely different ingredients so please do not interchange them. Can the butter be substituted with a neutral smelling oil, say rice bran? Nalini: Yes it can but the texture would be different. 1. Can I use Whole wheat flour (the regular gehu aata with which we make chapatis) instead of all purpose flour? 2. If making this recipe with eggs, how many eggs to be used? 3. Can you suggest more whole wheat flour cookie (absolutely no maida) recipes as my son is not allowed to eat maida products. Aakriti: Yes you can use whole wheat flour. I have dedicated much of this space to eggless cooking and baking and if you want me to convert an egg based recipe into it without eggs then I will be glad to help. Hi! I had made these a long time ago with old fashioned rolled oats. It tasted great bit did not look as great as yours. As I flattened out the balls on the baking tray…I noticed they expanded into larger shapes while baking and even got attached to one another in the same line! The pictures look like they are golden in colour….mine came out dark brownish. Any reason? The cookies have to be rolled into small balls and placed with distance from each other, allowing them to expand while preventing them from sticking to one another. The difference in colour could be due to the difference in the molasses content of the sugar used. So I dont need to flatten the balls ….just roll and place them apart from each other? I have been an ardent follower of your recipes, majorly since it is all eggless and I am only into vegetarian baking.. So it is always a delight to browse through your recipes.. I tried the Plum cake earlier and it was just perfect.. I want to try these cookies too, but I don't know where I can find the flax seeds..Can you please share where do you get them from? Or anything I can substitute for them? Also, what is the texture of flax seeds like? I once found them at a Mukhvas ( mouth-freshner) stall in an exhibition, but they were too crispy and could be eaten directly like that..Can those flax seeds be used here? Hiral: Sorry for the late response. Flax seeds can be found in health food shops/organic stores and even in kirana stores. ask for alsi seeds. 24 letter mantra/navdanya stock flax seeds. Taruna: You could use any brand of quick cooking rolled oats. Neetu: Thanks for noticing the efforts behind putting up a recipe. I always try my best so that my recipes are accurate and anyone who makes it should be happy with the results. Can I use margarine instead of butter for any of the cookies recipe including this one?? Hi… Thanks for the lovely recipe…. 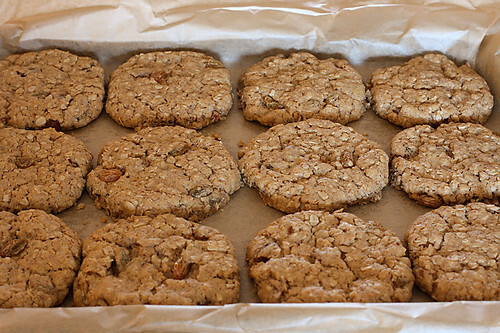 tried this out yesterday…..the cookies turned out awwwwwwwweesommmmmmmmmeeeeeeeeeee….. the aroma when the cookies were nearing the end of the baking process was simply divine….. n the taste was absolutely incredible… lots better than store bought ones….. everyone loved it… this would be my 'ONLY' recipe for oatmeal raisin cookies…. Charanya: How nice to know that Charanya!Thanks for the feedback. Hi dear… Ur recipe is awsome. But my cookies were soft from centre and got brown from outside. They also were stuck to the tray at the centre. Is it becos i used convection method in a microwave.. I alao civered wire rack wid foil and used that as tray. Please plz help. Thnx. Uma : I never use or recommend baking in a microwave, although many people over here have baked my baking recipes in a microwave with good results. First of all let me say thank you for the recipe… I tried this recipe and it came out veeeeerrrreyyyyy tasty…. I ran out of raisins so I substituted with cranberries… And they came out yum yum yum… My husband, my aunts, my family members were in love with the cookies… For the next three four days I was having these oatmeal cookies along with my morning tea…. Heaven…my aunt who tasted the cookies had a request though… She asked me if I can bake these without sugar.. (she is a diabetic, but she couldn't resist munching on couple of the cookies inspite of her being diabetic :-P) I told her we can't coz the crunchy feeling in the cookies came from the sugar and oats… Please do help me with this query…and I bake mostly Eggless bakes and your blog is a delight to visit for recipes if I want to try any new Eggless recipe… This time around I will try these cookies with the WWF our regular aata. Swetha: I'm pleased to hear that. Thanks for the feedback and look forward to hearing more from you. My aunt called me yesterday to ask if i can bake her these oats cookies sugar free…Can i make the same with Sugarfree???? m about to experiment with the same.will keep you posted with the outcome. swetha: Look forward to hearing about your experiment. Jayashree: Thank you for the feedback! Such a perfect Example of Oatmeal. I m loving it. Can I make these cookies without any dry fruits, just plain. Can i use whole wheat flour for this recipe? Priya: Never tried making these with oil, I think it might work, but the texture wont be the same. I used salted butter for this recipe. Hi , I tried this receipe but the raisins got burnt ,,, the taste is yum but how to make them without burning the raisins ? Neha- Did you bake in the top rack? The raisins have a chance of getting burnt when they are baked on the top. neha- Good to know that! I tried your eggless oat cookies with the addition of cranberries along with raisins. They turned out excellent. Thanks for posting them.